Posted in Brownfield Sites, Hart District Council, Hart Local Plan, Infrastructure Costs, We Heart Hart Campaign, We Love Hart Campaign and tagged Alan Wenban-Smith, Bramshill, Community Campaign Hart, Fleet, Grove Farm (Netherhouse Copse), Hart District Council, Hart Local Plan, Hartland Village, Hook, Murrell Green, Rye Common, We Heart Hart Campaign, We Love Hart Campaign, Winchfield. In terms of a purely greenfield argument for Pyestock, I’d suggest losing some farm land to preserve a nature reserve and SSI would make a good argument. So even if the whole of Pyestock couldn’t be incorporated into the nature reserve, then scaling back the development to hug the southern boundary road and having the north as a buffer to the nature reserve would perhaps be a good compromise. Then take some farm land to compensate. As for suggesting the consultation is “irrelevant” (which is a strong term) just opens you up to people saying it is just sour grapes. There are some general principles, like the urban extension votes that aren’t site specific, and anyway, by saying the views of the people who voted against your arguments are “irrelevant” you are harming your chances of bringing people across Hart together – which I agree with you, is what we need. And brownfield development was given in the consultation as an option that should be pursued in preference to any other option. But we weren’t given a vote on it. Pyestock wasn’t on the table at the time of the consultation. And Winchfield has failed testing. So the consultation is irrelevant. I do agree that brownfield and green field should each be evaluated on their merits. But I will take a great deal of convincing that there’s any green field site in Hart that should be developed in preference to Pyestock. Your article quoted the consultantion, but your spreadsheet failed to mentioned the people of Hart’s favoured development which was Winchfield. The votes were: most favoured: 2625, 2nd favourite: 274; 3rd favourite: 1582. You also refer to Pyestock. The results for this type of development (urban extension) were 564, 2107 and 1810, so mid to least favoured. I agree that all interested parties should work together, but trying to do it from the point of view of promoting brownfield (which predominantly means east Hart) is not a way to gain consensus. I would suggest that if you accepted some greenfield development in west Hart and stopped the simplistic/misleading statements that brownfield is always the answer (as I’ve pointed out elsewhere it is a simplistic/misleading argument as all places needed to be considered on a case-by-case basis), then people in east Hart may be more inclined to support your cause. 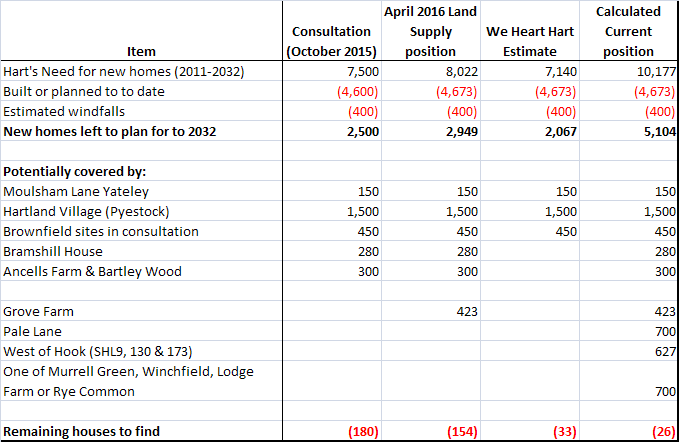 I Heart Hart as much as you do, but the only way we are going to continue loving what we all have is by showing some consideration for all the district’s views, especially when, if the consultations was anything to go by, targeting the people of east Hart was the least favoured approach. CCH must be rubbing their hands with glee more concrete than even they could dream of. 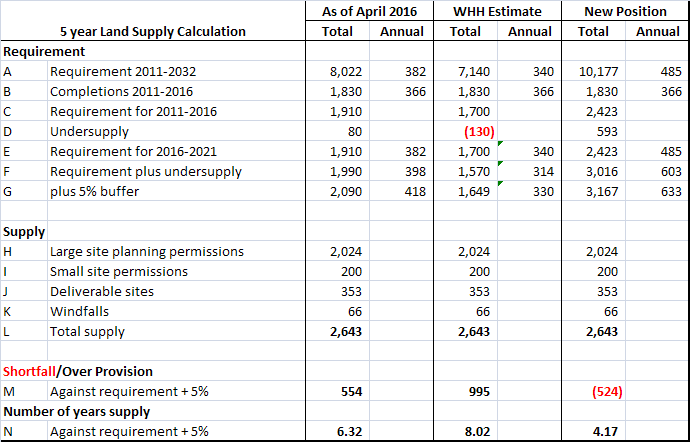 How and when could you anticipate the council confiming some real numbers to work with bad or good. This has become the constantly moving goal post.